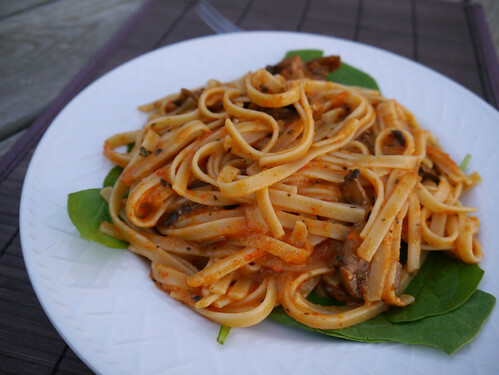 Confession time: I did not make this pasta from scratch! I am way too lazy for that. However, the roasted red pepper sauce is homemade (do they even sell such a thing in stores? ), and furthermore I roasted and peeled the peppers all by my little lonesome. And it took forever, I might add! Usually I seed and slice them prior to roasting, which is always in olive oil and a glass baking dish. (The olive oil is awesome for reuse in pasta dishes, since it’s infused with pepper juices!) With this method, the peels practically fall off the roasted pepper slices. SO GOOD. I need to make red pepper sauce more often, y’all. This entry was posted on Sunday, November 9th, 2014 at 1:32 pm. You can follow any responses to this entry through the RSS 2.0 feed. You can leave a response, or trackback from your own site.